It's finished. Simplicity 2250 is a fully realized pink seersucker dress. Thank God. Let me be honest, kittens. This was the pattern from Hell. I thought I would never finish this thing. At some point during the bodice, I began having visions of being trapped at my sewing machine, sewing the same dress over and over again, never completing it. 2250 could easily turn one into the seamstress version of Sisyphus. But let's start at the beginning, shall we? 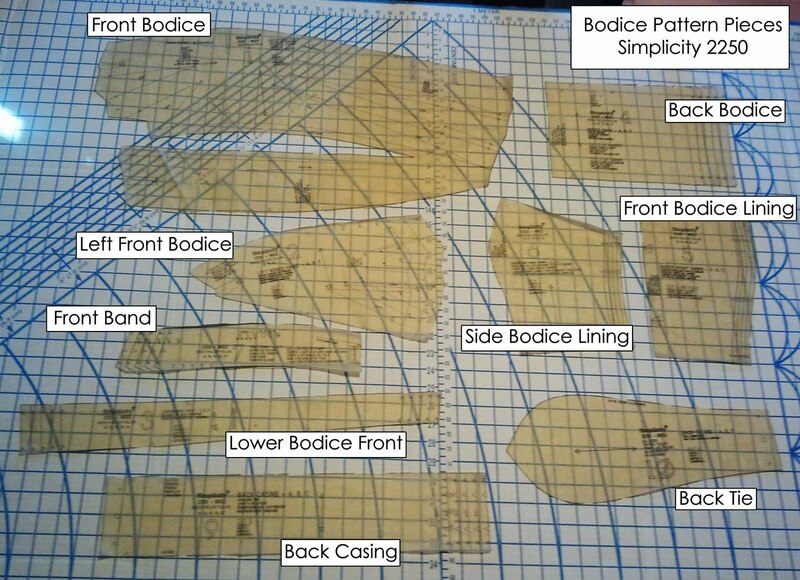 Thursday night, after my shiny new machine arrived, I naively set out to construct the 2250 bodice. Normally, it takes me three days to sew a dress - one to sew up the bodice, one for the skirt, then one to hem the thing while watching a BBC period drama (I prefer to do an invisible hem, rather than a machine-sewn one, so it takes a bit longer). I was convinced 2250 would be no different. I was wrong. Way, way wrong. This became clear while constructing the bodice. Or, as I like to call it, The Crazy Bodice From Crazy Town. To illustrate my point, I took some photos. First off, there are nine pattern pieces for the bodice alone. Nine. Three of which are cut four times, two of which are cut twice. That's twenty pieces just for the bodice, kittens. 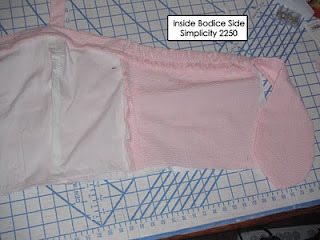 Part of this is because the bodice is not just lined, but also underlined. (Which is a whole different issue I'll complain about later.) Most of it, however, is due to the complexity of the bodice itself. In just the front shell, there are three pieces: the front bodice, the left bodice, and the lower bodice front. These three pieces have, combined: six darts, one crazy dart (the raison d'etre of the slit in the front bodice pattern piece - it's a dart that extends the horizontal length of the bodice), three pleats, two seam lines, and a fold. So, that takes a while to construct. If you prefer to pin-mark your darts and folds, this construction may actually make your head explode. My pattern tracing wheel and contact paper made all the lines and dots somewhat more manageable. It still took three hours to sew the front bodice pieces, however. What you end up with looks, on the inside, like a topographical map of the Steppes of Asia and less like a conventional bodice. Do not be frightened. This means you did everything right, even if you did accidentally sew the pleats in the wrong direction (they all fold different ways) and had to unpick them. From the front, miraculously, the look of the effortlessly draped bodice in the pattern photo does come together. Well, for the most part. I'm not a fan of the pleats - the darts give great shape, while the pleats seem a bit like unnecessary clutter. There's minimal value-add for how much I worried over the directions of those things. But, despite the headaches, Cynthia Rowley did design an aesthetically interesting bodice here. It's a look that is very ready-to-wear and a bit elevated over the typical Simplicity pattern. However, despite the front bodice being the main draw of the pattern and what seems to be the difficult portion initially, all was not downhill from there. You see, the back bodice has not just an invisible zipper, but also elastic and ties. All of which one has to muddle through sewing and piecing together. For my first time inserting elastic, I was amazed by how easy it went together. Simplicity suggested clipping a safety pin to one end, in order to manage it better, which was a brilliant suggestion. Their lining instructions and invisible zipper guidelines, however, were dreadful. Y'all, I sewed the bodice lining in twice and pinned it two other times. It still didn't end up working. 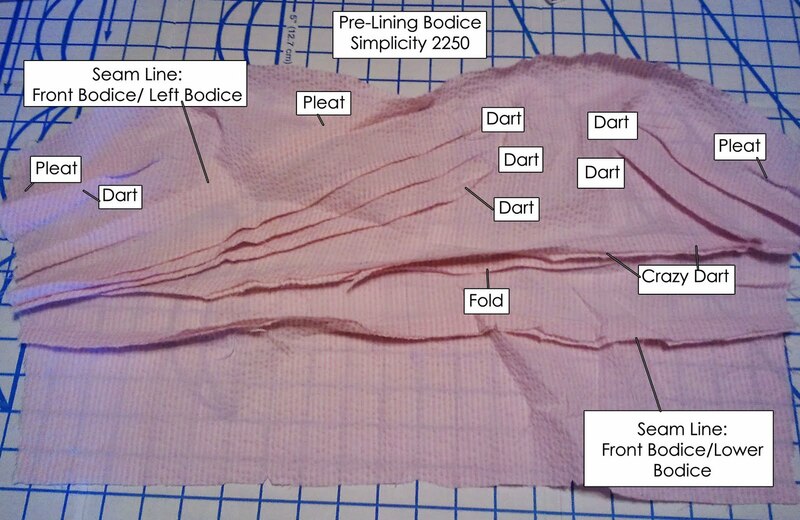 The diagram Simplicity provides makes it seem as though you should attach the lining from the bottom of the bodice (something I thought was fishy, but didn't stop me from sewing it completely in that way). When you do realize the correct orientation, their guidelines then instruct you to fold under the seam allowance...which is great, except it makes the bodice lining about 5/8 inches too short for the bodice. Cue foaming at the mouth. Additionally, the invisible zipper directions should just be thrown out the window. 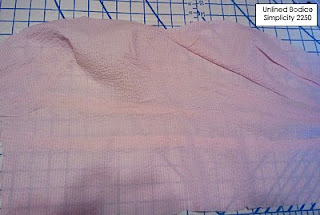 If you're putting in an invisible zipper for the first time, I suggest either Sew Serendipity's tutorial or Threads'. No doubt, you're noticing a certain amount of frustration by now. It was worse this weekend, when I was in this middle of sewing this up. Here's the thing: I'm a reasonably intelligent person. I have two undergrad degrees, a Masters in Epidemiology, and am in the process of getting a Ph.D. I totally own at Trivial Pursuit and Scrabble. But, Simplicity 2250? It made me question whether my SAT scores were mixed up with someone else's, because surely I had to have the IQ of a turnip to mess up so many times. Patience is widely held as the number one virtue sewers should possess. Well, you better possess it in spades, if you plan to attempt this pattern. Each individual step isn't that difficult, but all of them together in one garment? Oh, that way madness lies. There are too many places to make mistakes and not enough instructions to prevent them. But, alas, onto the skirt. I can wholeheartedly say that the skirt was much easier to sew up. 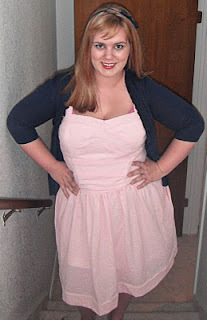 There is a lot of gathering and a few pleats, but compared to the bodice, it's a breeze. That being said, I ended up unpicking mine and changing it completely. 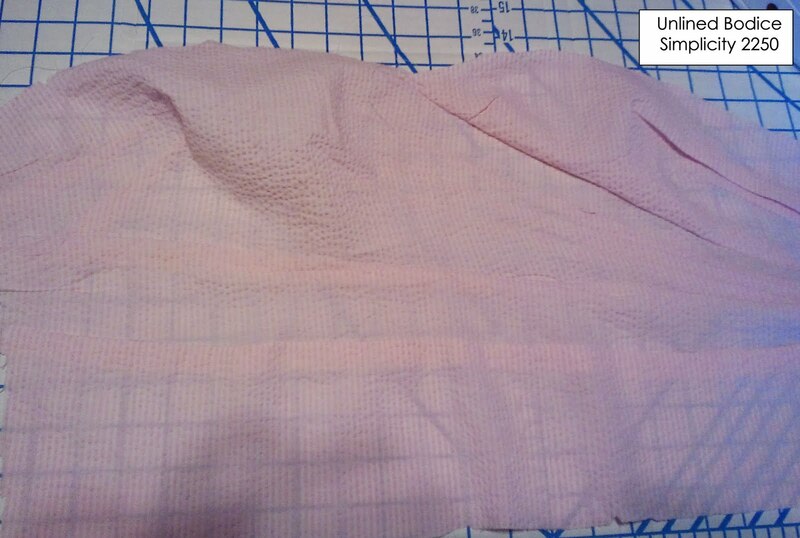 It's hard to tell on the pattern envelope, but the waistband is fairly asymmetrical. This design may work on some people, as it does on the model, but it was abysmal on me. My measurements are a fairly traditional hourglass (42-32-43), but the concentration of gathering on the sides of the skirt, compared to the middle, made me look decidedly pear-shaped. Unfortunately, I neglected to snap any pictures of this stage. It was nearing midnight and I was nearing the end of my rope. 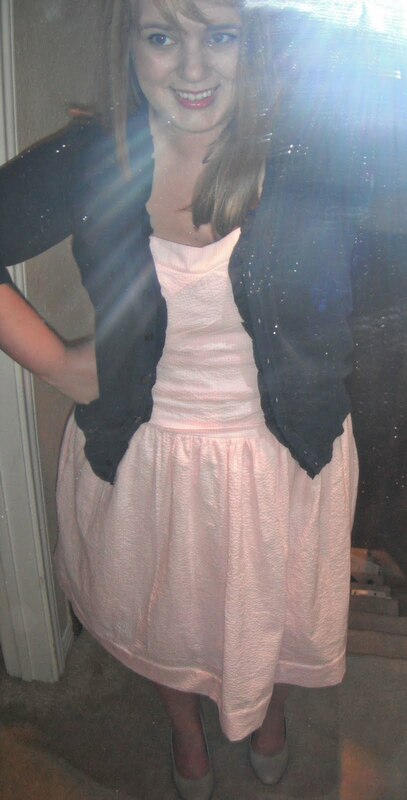 However, the effect was horrid enough that I ended up undoing the skirt, then taking out the existing pleats and gathers. The pattern pieces themselves are just traditional rectangles, so I gathered all the way around and turned it into a much more flattering dirndl. Overall, it ended up being a cute dress. Even though I did a muslin and made some fitting alterations, the bodice is still a bit big big through the armscye, but it's not noticeable to the untrained eye. With the few pattern changes I made (detailed a bit further down), it looks remarkably like the pattern photo. A cute, interesting sundress. However, not one I will make again. With the time it took me to make 2250, this should be the most adorable dress ever. It's cute, but not cute enough to make up for all the aggravation. If you do attempt 2250, I hope you have better luck. 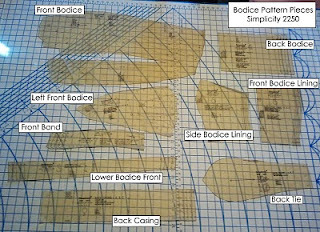 To that end, I've listed up some of my pattern alterations, further notes I made along the way, as well as some suggestions to avoid the mistakes I made. Lengthened the Lower Bodice Front by 3 inches. I'm 5'8'' and this dropped it to a better waist placement for my height. Lengthened the Front Bodice Lining and Side Bodice Lining by 3 inches. Lengthened the Back Bodice by 3 inches. Used a 9 inch zipper, instead of a 7 inch. Altered the placement of the straps, for what flattered me more. Went down two sizes to a smaller front band. Lengthened the Skirt Front, Right Back, and Left Back by 3 inches. Again, just an adjustment for my height - this allowed me to take a deeper hem and have more say about where the dress hit. Eliminated existing gathers and darts on skirt, replaced with traditional dirndl skirt even gathering. Added a lining to the skirt. Eliminate pleats altogether, replacing them with darts. Put in a traditional zipper, rather than an invisible zipper. Where the zip meets the elastic is a bit clunky, which would be mitigated with a traditional zipper. Eliminate the "Fold" in the Front Bodice. It's an odd design element that is partially hidden by the Crazy Dart anyway. I feel like the bodice would look more streamlined without it. Mark every center, dot, and line very clearly and carefully. In no other pattern I've sewn have these marks been as important as in this one. Without these clearly marked, you'd be in for a lot of unfortunate guesswork or belated marking. I'd really think twice about the invisible zipper in this dress. Because of its nature, the invisible zipper didn't work well with the elastic top. I had to do a lot of hand stitching to get it to work without gaps at the top, where the two meet. Really watch your pleat directions on the bodice. All three pleats go in different directions, which is rather counter intuitive. I think it's meant to contribute to the asymmetrical draping effect of the bodice, but it's a headache. It's a cute dress, even if it was a headache! I have it on my to-do list, and I will keep your advice in mind. Do you think it really needs an underlining? I usually only do that on thin fabrics, and it's odd to see it called for in a modern pattern! I love this pattern too, CR is an auto buy for me. But I am very gratefull that you posted the full account of your...experience (I wanted to type ordeal but let's stay positive, right?). I think this is the sort of project for a long week-end and a full stomach. Lovely dress on you, and I love your spring colors. Stitchywitch, thanks so much for stopping by the blog! I completely agree with you about the underlining - it's a very strange thing to run into, especially in a 2011 pattern. Honestly, I think the only purpose of it is to make the bodice more aesthetically pleasing while you're sewing it up. The inside of the bodice is rather intimidating, so Simplicity may have just put it in to make constructing the rest of the dress and notation matching a little easier. Though, just to check, I took another look at my dress this morning, but I still didn't see anything that makes it necessary. If the fabric is sheer, then it's useful to hide the inside facing of the top band, but if it's a regular weight fabric that doesn't factor in. If I were going to sew it again, I would probably leave it out altogether! Larika, thanks for commenting! CR is definitely an automatic buy for me - have you seen her newest Simplicity Spring '11 pattern? I saw it for the first time last night and actually gasped it's so great! Hi Laura! Aww, thanks so much. I'm glad you like it! It is a really lovely bodice design, isn't it? That's what drew me to the pattern initially, so it was rather amazing to see it come to life. The effect is striking, even if it took a lot of work getting there! I love this dress on you it looks so lovely! Thanks for the tips, i'm an hourglass shape so i will try gathering all the way round too. With all the fitting problems i'm having at the moment, i think i might wait a while before i try this one though. Hope you are having a great week! The dress looks lovely on you though I don't envy you the headache you had to go through to get to the final product. I will be making a note to avoid trying this anytime soon, even given the helpful hints you advise when reflecting back on this one. Hi Sabrina! Yeah, this is a very intimidating pattern to do an FBA on. I actually ended up not doing a traditional one at all. Instead, I used the size for my high bust, then changed the size of a few important darts and made sure the waist was the right width. It took a bit of finagling, but I was completely befuddled as to how to do a traditional FBA on this. If you figure out how to do one, I would be really interested in hearing about it. This is definitely on the master level of bust adjusting! Hi Alexandra! Thanks so much for the comment. I'm so happy you like the dress! I definitely recommend gathering all the way, since you're also an hour-glass - plus, it makes the skirt even easier to put together! Never a bad thing, right? Hope you have a wonderful week, as well! And good luck with the fitting issues you're having. That is the most frustrating thing - it would be lovely to be able to wear a pattern right out of the envelope. Thanks, Steph! Yeah...this is so not a pattern I would recommend, since you're just getting into fashion sewing. It my squash the excitement of sewing right out of you. That being said though, I think this style would look completely amazing on you. With your body type, the draping would look even more smashing. I'm currently trudging through Simplicity 2250. It's great to hear that someone else was frustrated as well. Even without the inevitable minor boo-boos it's taking FOREVER to complete. What a lovely dress! Thanks for all te tips. I'm embarking on this project and think I'll be re-reading your post quite a bit as I go along. That stapler-shaped bodice piece is downright scary. Hello, I'm attempting to try the bodice on this pattern. I usually have alot of patience, not today! I'm using a silky fabric which may be my problem. May attempt to do a muslin version at a later date. Love your insight on this pattern. I thought I may be the only one going mad! I just "built" this bodice over way to many hours. The directions for the double lining were horrible. My 15 year old was supposed to make it, but in the end, she watched me and helped interpret the directions. I hope it fits the intended wearer, it would be brutal to alter! Kid In A Candy Store: New Simplicity Patterns!